Rabat---The US embassy in Rabat celebrated Achoura on Saturday at the Tazi Palace cheering up more than 900 orphans coming from different regions of Morocco. Achoura commemorates the martyrdom of Hussein, the grandson of Prophet Mohammed (PBUH) at the Battle of Karbala in the year 61 AH (AD 680) during the quarrel to the succession of the prophet. 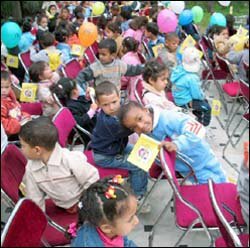 More than 900 orphans coming from Sidi Kacem, Settat, Meknes, Temara, Casablanca, Sale and Moulay Driss Zerhoune/Fes benefited from this special event co-sponsored by Coca Cola and McDonald. Coca Cola and MacDonald provided the orphans with food and beverage along with Music and animation. Since Achoura's feast is considered like Christmas for the children, both US companies distributed gifts for the kids on this occasion. Representatives of several other embassies including the Bangladeshi, Korean, and Egyptian attended the event to share with the children their happiness in Achoura. The US embassy has recently organized a solidarity day with the orphans on the occasion of Eid al-Adha. Achoura's event is the fourth of its kind that Palais Tazi agrees to host for the benefit of orphans. The owners of the palace are intending to invest in the health field through the creation of a foundation called “Attasahol Foundation”, to manage activities related to orphans and children's health. In the same vein, the spouse of the US ambassador to Morocco, Nancy Riley along with the spouse of the Bangladeshi ambassador will organize a Bangladeshi evening next Friday at the same Palace. At the evening, silks, saris, and Bangladeshi Arts will be open to sale. The funds, which will be collected, will go to the Red Crescent Social Educational Center in Rabat.